Throughout Summer 1642 both King and Parliament started mustering military forces in anticipation of civil war. 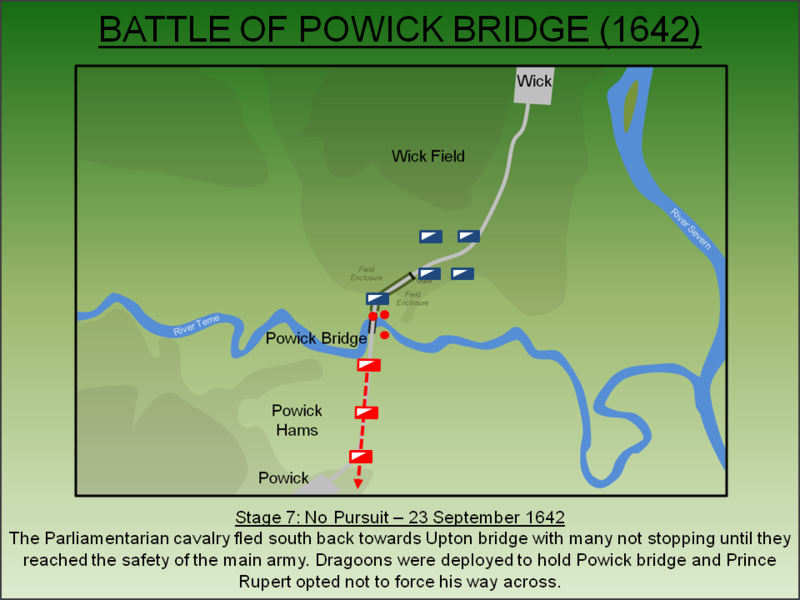 As the two armies grew in size, an engagement between them became inevitable and it finally occurred at the Battle of Powick Bridge on 23 September 1642. As Parliamentary forces attempted to intercept a Royalist convoy leaving Worcester, they were attacked and defeated by Prince Rupert. Charles I became King of England and Scotland in 1625 and, from the very start of his reign, advocated the principle of the divine right of Kings. When he sought to implement Catholic style reforms into the Protestant churches of both nations, he met fierce political opposition. Fuelled by his own self belief in his right to rule unfettered, he was either unable or unwilling to negotiate and in 1629 simply dissolved the English Parliament and ruled for the next eleven years without them. This became known as the “Eleven Years' Tyranny” or the “Personal Rule”. However, the role of Parliament was to grant taxation to enable the King to sustain a functioning Government and, without it, Charles was forced into adopting various schemes to raise revenue. Measures such as Ship money, Court of Wards and fines for non-Knighted landed gentry fuelled the Royal coffers. However, when combined with the religious changes, such measures made Charles extremely unpopular although the income raised was sufficient to sustain the Government during peacetime. Accordingly the grievances of the wider populace, which could only be articulated through Parliament, went unheard. The situation could have continued in this manner indefinitely but, through the King's own intransigence, peace did not last. The first war came when William Laud, Archbishop of Canterbury attempted to impose the English Prayer Book on the Scottish church. Opposition to these measures led to the National Covenant with its advocates representing a powerful section of the Scottish political class. These so-called Covenanters refused to implement the religious changes. Charles mustered an army but, without Parliamentary taxation, it was small and inadequate for the task. The subsequent conflict, the First Bishops War, ended with Charles seeking a truce. The following year the King tried again, prompting the Second Bishops War, but again his force was too small to be effective. Furthermore the Scots had organised themselves and were headed by a powerful political body, the Committee of Estates, which directed the war effort. Charles now had little choice but to muster a full-sized army to deal with the situation but this required significant more money than he had available and he was left with no choice but to recall the English Parliament. However, after eleven years of taxation without representation the members of Parliament wanted significant reforms and redress before they would grant any money. This Parliament, which was in session between 13 April 1640 and 5 May 1640, became known as the 'Short Parliament' for its demands were too much for the intransigent Charles who simply dissolved Parliament once more. The situation in Scotland however was unresolved and in August 1640 General Alexander Leslie led a Covenanter army into England. He defeated Royalist forces at the Battle of Newburn (1640) and then occupied Newcastle-upon-Tyne. Again the King was forced to call a truce but this time the Scots were working in co-ordination with key Parliamentarians and one of their key demands was £850 a day to fund their occupation of Newcastle. This was unaffordable for the King and he was compelled to call a new session of Parliament. What would become known as the 'Long Parliament' mustered in November 1640 to consider the King's request for funding. Again King and Parliament became locked in a political stalemate and it was only in August 1641 that the Treaty of London formally ended the Second Bishops War. However, it was an Irish rebellion in October 1641 that brought things to a head. Charles again needed an army but by now the two sides were deeply distrustful of each other and Parliament feared the King would use any force raised against them. At this time England had no standing army but each county had Trained Bands comprised of part-time soldiers who were called out via each county's Lord Lieutenant as the King's representative. If Parliament granted Charles I funding, he would have had the means and mechanism to muster a large army. This led to significant concern amongst the Members of Parliament and so they passed a Militia Ordinance in March 1642. This was effectively an of Act of Parliament, but without the King's seal, and provided Parliament with the power to replace the Lord Lieutenants with their own appointments. In May 1642 the King specifically forbade compliance with the Militia Ordinance and thereafter started to amass military personnel around him. The Militia Ordnance was put into effect in early June and leading Parliamentarians started mustering forces - Henry Grey, Earl of Stamford called out local levies in Leicestershire whilst Lord Willoughby did the same in Lincolnshire. In response the King issued Commissions of Array to local gentry (including deposed Lord Lieutenants) authorising them to summon the Trained Bands. Needless to say, the bands themselves reflected the wider populace with divided loyalties and so both sides started issuing commissions to raise volunteer regiments. On 23 August 1642 Charles officially raised his standard at Nottingham declaring war on Parliament. The two sides spent the rest of August and early September recruiting forces and training them. The King moved west to Shrewsbury where he hoped to be centrally placed to receive significant numbers of recruits from Wales and the Marches. Parliament's army had been placed under the Command of Robert Devereux, Earl of Essex who occupied Northampton before starting to move west towards the Cotswolds. Over the course of the next few weeks the two armies grew in size and, as their spheres of influence grew, an engagement between them became ever more likely. On 16 September 1642 a Royalist force under Sir John Byron entered Worcester. He was en route from Oxford to Shrewsbury escorting a significant amount of money provided by the University of Oxford to fund the Royalist war effort. His force was small and Parliament saw an opportunity to dislodge the Royalists. Essex commenced an advance on the city and sent ahead a vanguard, under Colonel John Brown, to capture it. He arrived outside Worcester's Sidbury Gate at dawn on 22 September but was denied entry. Rather than storm the city, he withdrew deciding to await the overwhelming numbers of the main force. 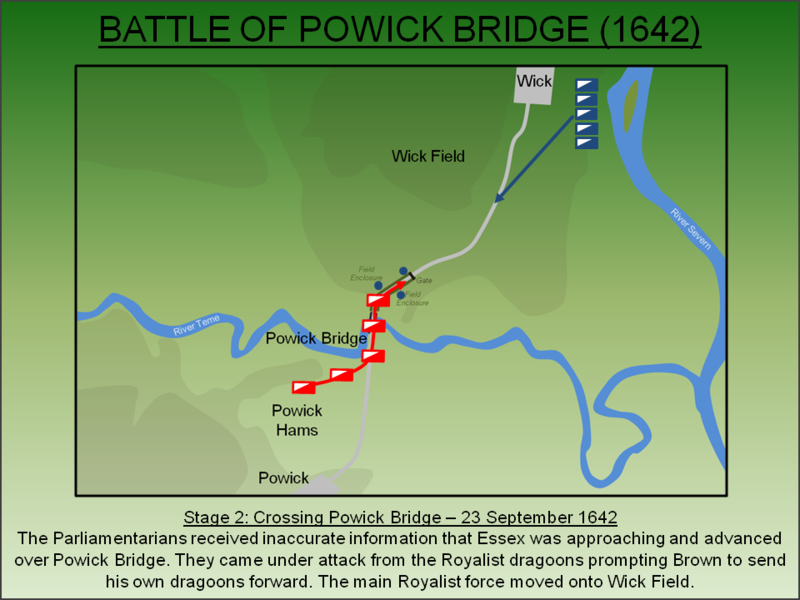 In the meantime he calculated that when Essex attempted to force the city via the west, the Royalists would leave via Worcester bridge and escape east. Accordingly Brown marched his men south to Upton bridge, which spanned the River Severn, and then advanced to Powick bridge over the River Teme. This was just two miles from Worcester and close to the main road out of the city to the west which also led to Shrewsbury. Brown now halted his troops and waited for the main force to arrive. 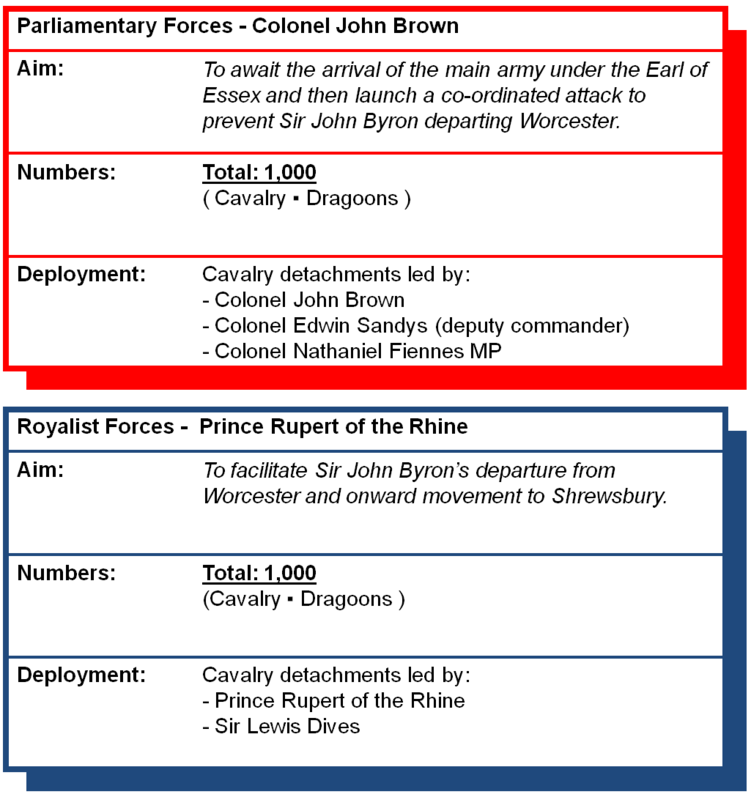 The Royalist intelligence network had proven to be effective for the King was aware of the Parliamentary manoeuvres and dispatched Prince Rupert from Shrewsbury with a force of around 1,000 cavalry tasked with supporting Byron. 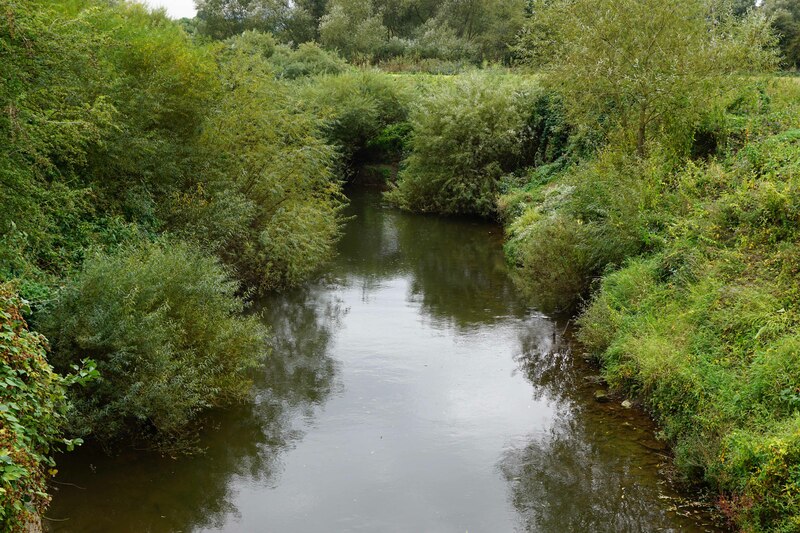 He arrived in the vicinity of Worcester during the afternoon of 23 September 1642 and deployed his cavalry in Wick Field to the north of Powick Bridge. 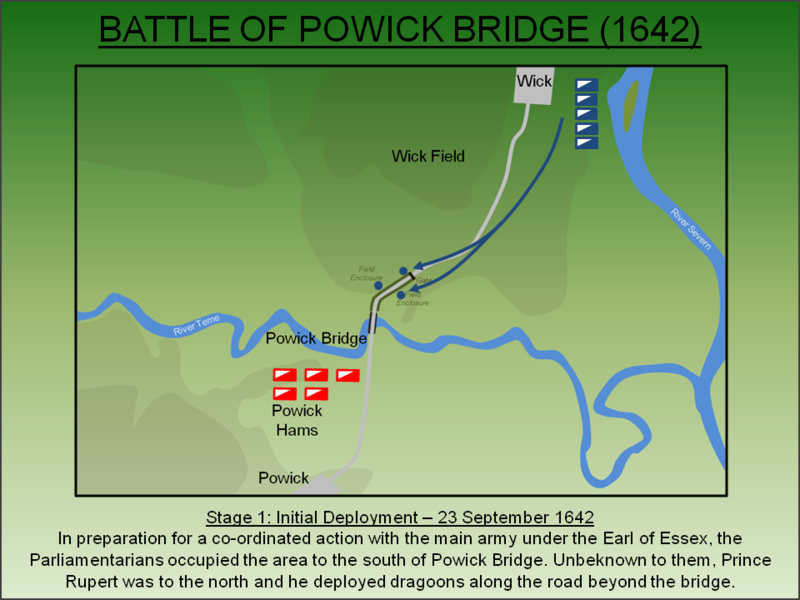 Both forces at Powick Bridge were around 1,000 strong and predominantly mounted. The Royalist army was under the command of Prince Rupert of the Rhine, a 22 year old who had previous military experience fighting on the continent. The Parliamentary vanguard was under the command of Colonel John Brown, an experienced soldier, but his discretion was fettered by the presence of three Members of Parliament - Edward Wingate, Nathaniel Fiennes and John Fiennes. Wingate in particular wanted Brown to delay an advance and wait for the main army under Robert Devereux, Earl of Essex who was approximately one day's march to the south with a force 20,000 strong. In contrast Brown's deputy, Colonel Edwin Sandys, was keen to push on to Worcester. The battle (although it is perhaps best described as a skirmish) was fought on the afternoon of 23 September 1642. The Parliamentarians arrived in vicinity of Powick Bridge at dawn on 23 September. Brown decided to linger at the bridge, perhaps due to the influence of the attached Members of Parliament, and moved his cavalry onto Powick Hams to rest. However, by mid-afternoon the Parliamentarians received a number of false or inaccurate reports suggesting that Byron was on the verge of leaving Worcester and that the Earl of Essex was approaching the city from the south-east. 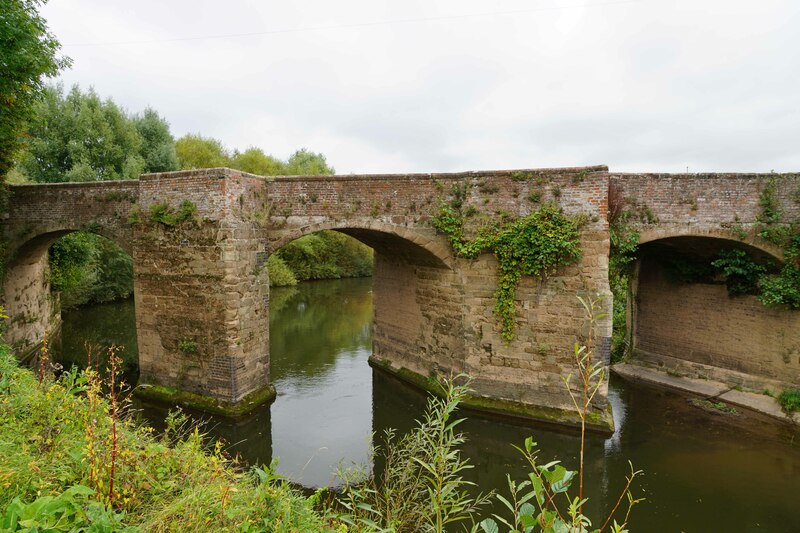 In reality the Earl was still twenty miles away, Byron was not about to leave the city and Prince Rupert was waiting just to the north of the River Teme for the Parliamentarians to cross Powick Bridge. Rupert deployed dragoons to line the hedges along the road to the bridge. 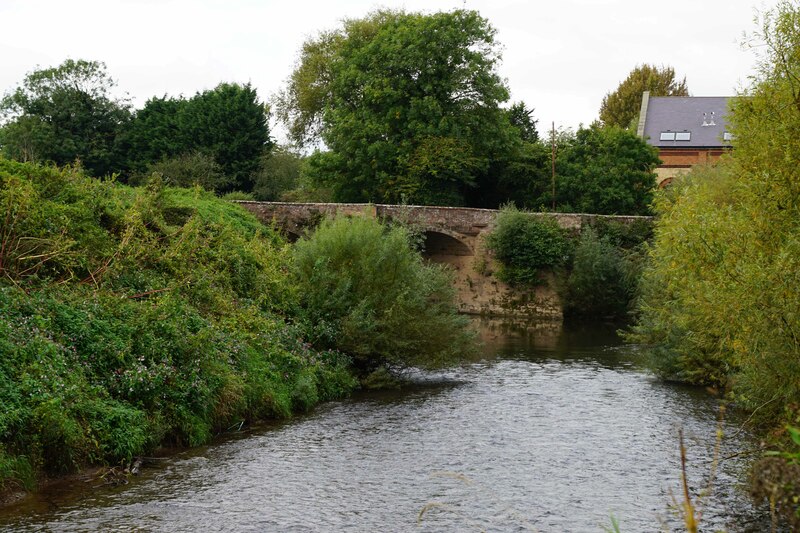 Colonel Sandys began crossing Powick Bridge and immediately found himself funnelled into a narrow lane which was bordered on both sides by tall hedges. Almost immediately he came under fire from the Royalist dragoons deployed by Rupert. Brown sent forward his own dragoons to clear out the Royalists but their advance was delayed as they had to weave their way through Sandys' men who filled the lane. On hearing their dragoons commence the engagement, the Royalists deployed onto Wick Field. As the Parliamentary dragoons advanced on their Royalists opponents, Sandys followed doubtless due to his concern that his current position, effectively trapped in a narrow lane, was untenable. He led his cavalry force out onto Wick Field and was followed by further detachments of Parliamentary cavalry. Rupert waited until around half of the Parliamentary force had deployed on the open field and then charged. 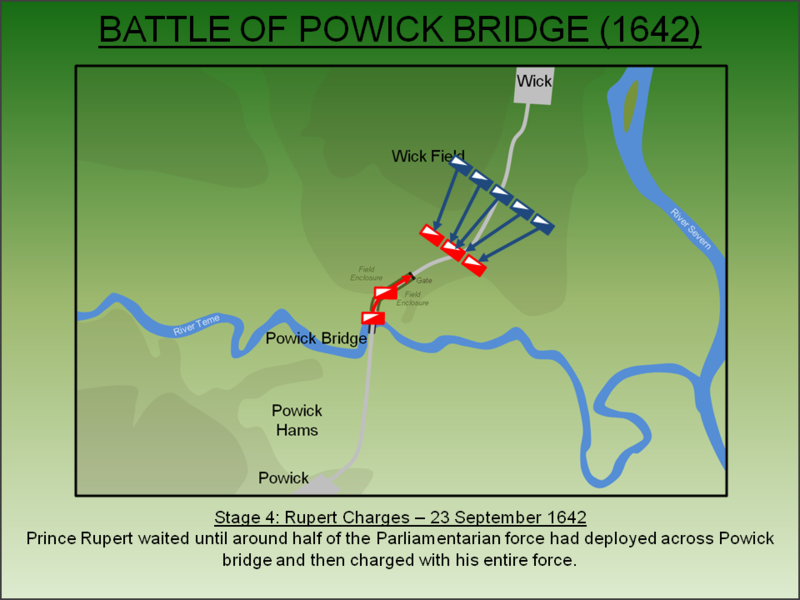 Rupert's own charge was effective and broke the regiment led by Sandys whose was killed in the action prompting his men to flee back towards Powick Bridge. However, the Parliamentary regiment under Nathaniel Fiennes held firm and met a cavalry charge led by the Royalist Sir Lewis Dives in a static formation with the two forces exchanging pistol fire at point blank range and virtually stationary. 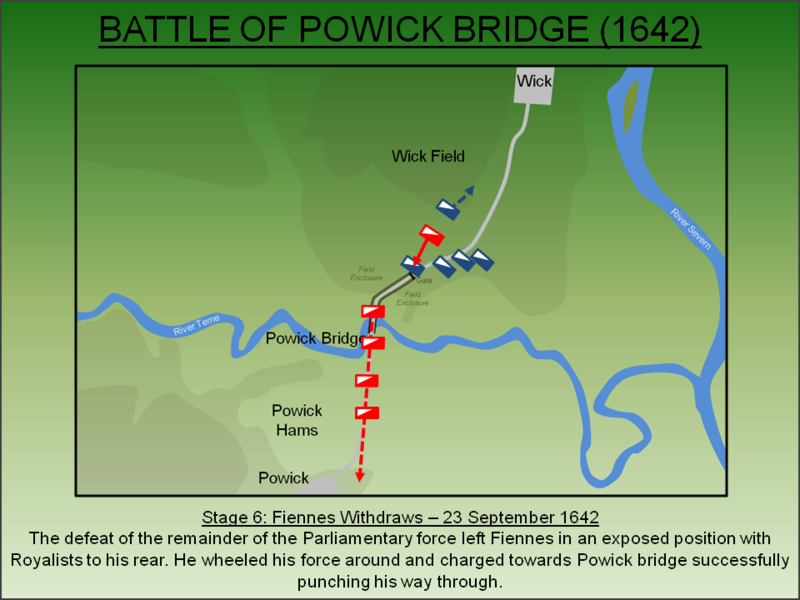 Fiennes had disrupted the Royalist attack but not decisively as the rest of the Parliamentary force had broken and fled back towards the bridge. Furthermore there were now Royalist forces to his rear. 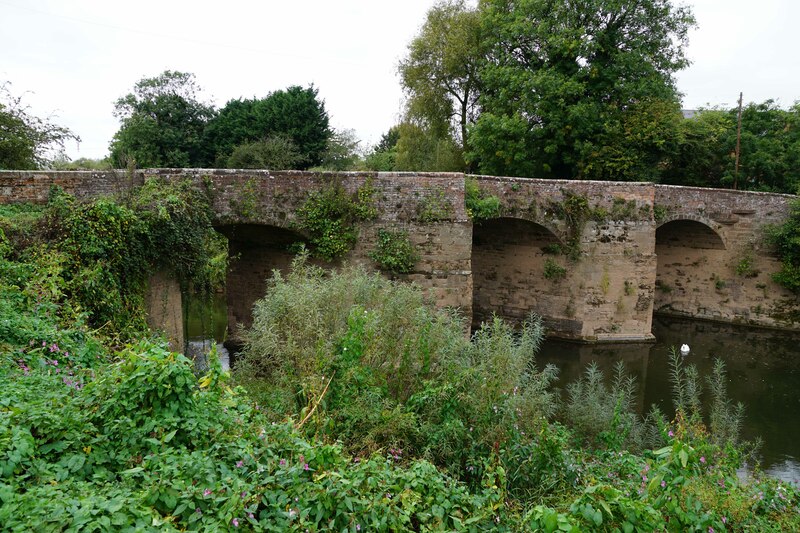 Fiennes wheeled round and charged the Royalists between him and the bridge enabling him to rejoin his own lines in the general retreat to Powick Bridge. 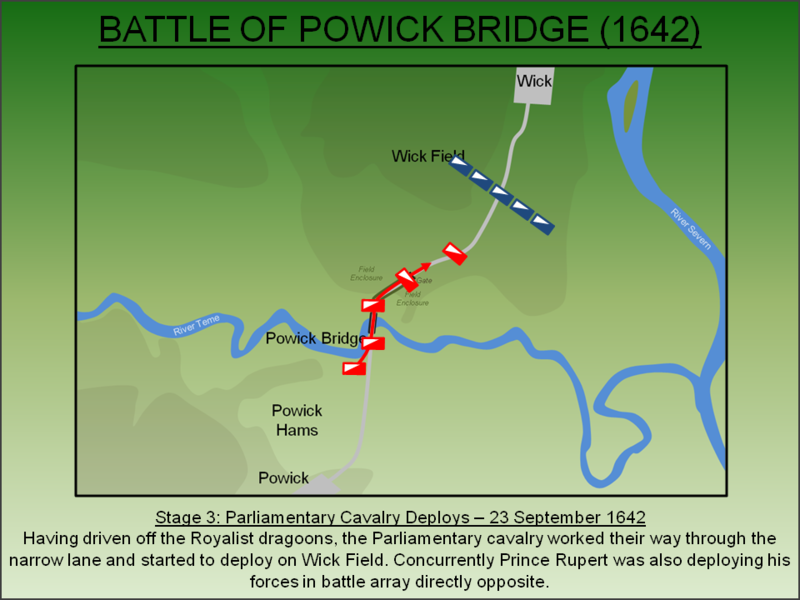 As the Parliamentarians fled back over Powick Bridge, Colonel Brown deployed his dragoons to hold it and this force managed to halt the Royalist cavalry. Rupert may have been tempted to pursue but his overriding objective was to ensure Byron reached Shrewsbury and he had already successfully cleared the road. Rupert did not attempt to force the bridge and the Parliamentarians were allowed to withdraw unhindered. However, this did not in any way reduce their enthusiasm for retreat. The Parliamentarian vanguard fled back across Upton bridge and on to Pershore, some eight miles to the south-east, where the cavalry attached to the main army was starting to arrive. The retreating troopers of the vanguard spread panic amongst these men who joined the flight heading back towards the main body of troops under Essex. Nevertheless, such facts did not stop Parliament publishing a pamphlet pronouncing their victory at the battle! Powick Bridge was little more than a skirmish, albeit one that cost 150 lives, but lessons were leant all round. Prince Rupert's strategy had been bold and he had started to forge his reputation as a great commander. However, he resolved that never again would any of his cavalry slow down to meet an attack stationary and instead should charge the enemy at the gallop with swords drawn. For his part Essex was appalled by the action, particularly the retreat of his own cavalry who were some eight miles from the actual fighting, and instigated an improved training programme. Rupert escorted Byron's force out of Worcester and on to Shrewsbury were the funds he brought were undoubtedly gratefully received by the King. On 24 September Essex advanced on Worcester and occupied the city. One month later the Civil War would start in earnest when the two amateur armies met at the Battle of Edgehill. Nine years later part of the final engagement of the wars, the Battle of Worcester (1651), would be fought in and around Powick bridge. Lancaster, J.H.D (2016). Powick Bridge: Battlefield visit notes and observations. CastlesFortsBattles.co.uk. Ordnance Survey (2015). Malvern Hills. 1:1250. Southampton. Tennant, P (1992). Edgehill and beyond: the people's war in the South Midlands 1642-1645. Banbury Historical Society, Banbury. Young, P (1967). Edgehill 1642: the campaign and the battle. Roundwood Press, Kineton. 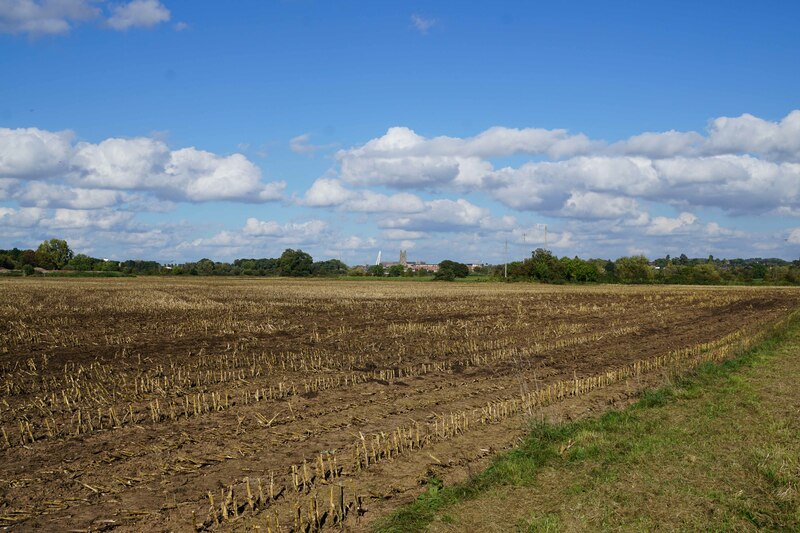 The battlefield has changed significantly since the seventeenth century with the area where most of the fighting took place now buried under the modern housing of Lower Wick. Powick Bridge itself survives although the road to the north is no longer flanked by hedges and is much wider than during the battle. 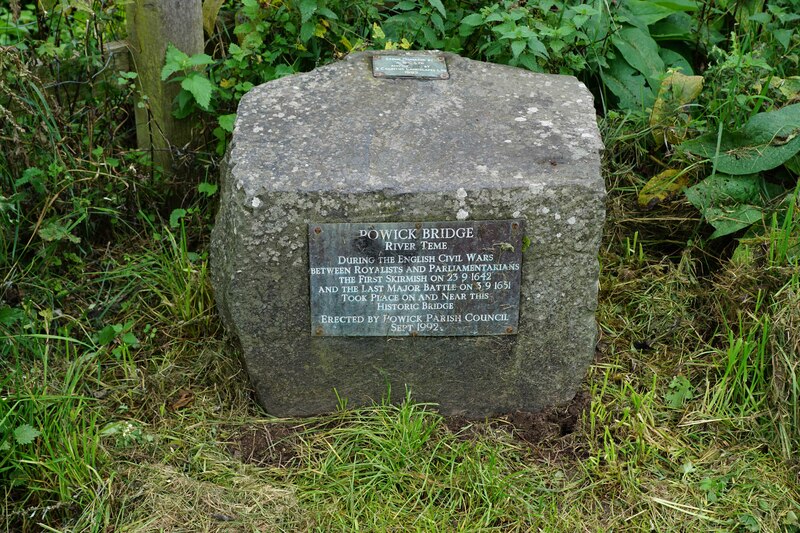 A small monument, remembering both this skirmish and the later Battle of Worcester (1651), can be found next to the bridge. Powick Bridge. The narrow bridge was a bottleneck that slowed the deployment of the Parliamentary troops. As they were retreating, dragoons held the bridge preventing the Royalists from pursuing. Battlefield Monument. The monument can be found on the north side of the bridge. River Teme. The river had steep banks making it unsuitable for fording and accordingly the bridge was the only way across. Battlefield. 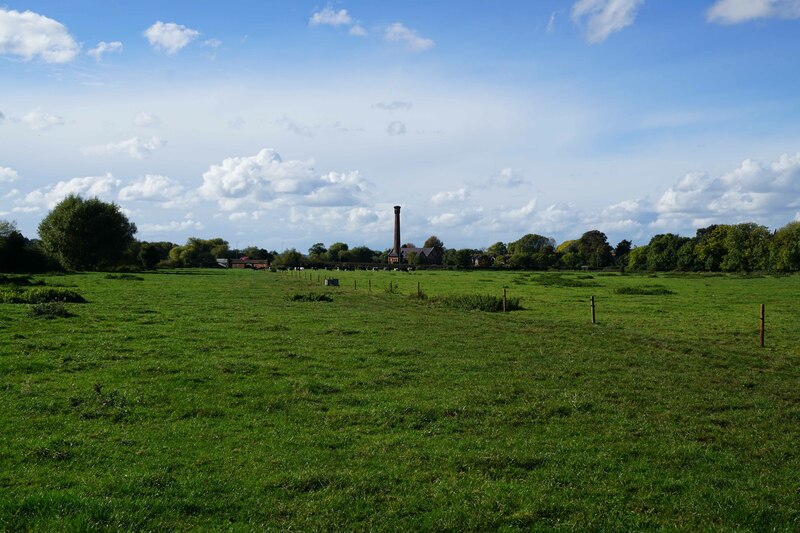 The eastern portion of the battlefield - Powick Bridge is in vicinity of the large chimney. The bulk of the fighting took place further north which is now occupied by Lower Wick. Worcester. Powick bridge is just two miles from Worcester. 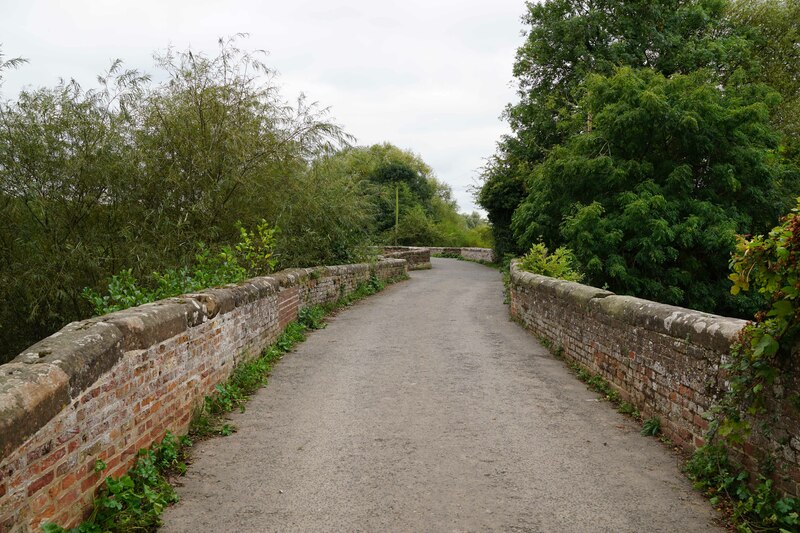 Powick Bridge is found on Old Road which is accessed directly from the A449 Malvern Road. On-road car parking is possible by the bridge. There is also a viewpoint on the A38 that enables an elevated view of the wider terrain (although this is predominantly focused on the later Battle of Worcester).